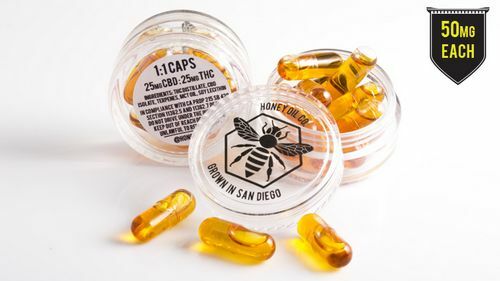 Honey Oil 1:1 CBD/THC capsules contain 25mg of activated THC and 25mg of CBD Isolate per cap. Formulated to be easily digested, these discrete capsules will keep your high going for hours on end! The added CBD helps to ease pain and will help you sleep at night. Ingredients: THC Distillate, CBD Isolate, terpenes, MCT oil, soy lecithin, gelatin.